Domhnall Ua Ríoghbhardáin was born in Ballaghbehy, Co. Limerick on 16 August 1888. His parents were Denis Riordan and Mary Brosnahan. Domhnall graduated from De la Salle teacher training college in Waterford. His first teaching post was in Nenagh, Co.Tipperary and he later took up the post of National Teacher in Maree, Oranmore, Co. Galway. During his early years in Oranmore he met his future wife, Katie Burke. Katie, a native of Galway City, was appointed National Teacher in Tawain in 1906, which is a few miles from Maree village. They married on 22 May 1915 and reared seven children. Colm was ordained a Jesuit in 1949 and spent over forty years as a missionary in Zambia. Breandán, the youngest member of the family, now living in Co. Wicklow, was Director of the National Museum of Ireland and retired from this post in 1988. Gearóid was a Sergeant in the Garda Síochána. Seán, Teresa and Caitlín remained single throughout their lives while Domhnall junior died tragically in 1947. Gearóid and Breandán both married and had families of seven and four. Domhnall Ua Ríoghbhardáin N.T. was an Irish language enthusiast, musician, singer, dancer and editor. He played the uilleann pipes. He was a member of the Gaelic League. He had an avid interest in nature and photography – he developed his own photographs. He played hurling while studying in De La Salle College, Co. Waterford. While Domhnall was in Maree he gave Irish language classes to teachers and pupils during the Summer holidays. Both Domhnall and his wife Katie were involved with the Irish Summer school in Tawain which opened in 1909. Domhnall was one of the founding members of Scoil Acla. In the 1920’s Domhnall was involved with Colaiste Mac Phiarais in Galway and was assistant editor for Fuaim na Mara. In 1928 Domhnall was a member of the committee which set up of the Irish Language theatre in Galway called Taibhdhearc na Gaillimhe. This drama company celebrated its 75th anniversary in 2003. Domhnall translated ‘The Rising of the Moon’ by Lady Gregory and ‘Riders to the Sea’ by J.M Synge. 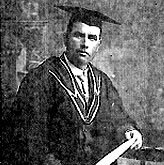 Domhnall Ua Ríoghbhardáin remained teaching in Maree until his untimely death after a long illness in 1935. He is buried in the New Cemetery in Bohermore, Galway City.